Pushing problems. Street creep can damage a foundation when concrete slabs in a driveway or road expand or move, pushing against the edge of the foundation. Your concrete slab driveway and foundation is cracked or damaged. We typically use a two-part process to repair foundation damage caused by street creep. Our structural technicians first install new expansion joints to help take pressure off of the foundation wall. We use wall anchors to stop inward movement of the foundation walls. We provide free, no-obligation foundation repair quotes throughout our Pennsylvania, New Jersey, and Delaware service area, including Reading, Newark, Philadelphia, the surrounding areas of Trenton, Camden, Wilmington, Cherry Hill, Bensalem, Vineland, Chester, and nearby. Call or e-mail us today to schedule an appointment! At Philadelphia Basement Systems, we recommend repairing damage done to your foundation by street creep with the GeoLock® Wall Anchor System. Next, a plastic liner is placed on the ground around each slab cutout made in the previous step. Unlike helical tiebacks, foundation wall anchors need only a small 1-in.-diameter hole to be drilled in your foundation wall for each anchor's steel rod to pass through. This is applicable for both poured concrete walls as well as concrete block walls. We Do Street Creep Repair In Pennsylvania, New Jersey, and Delaware! At Philadelphia Basement Systems, we have warrantied solutions for repairing street creep damage to your foundation. To help you decide if our solutions are right for you, we offer free written street creep repair quotes throughout our PA, NJ, and DE service area. 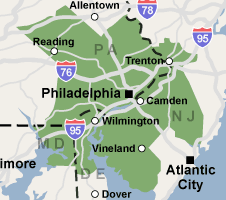 We serve the Newark, Philadelphia, Reading, area, nearby areas such as Trenton, Camden, Wilmington, Cherry Hill, Bensalem, Vineland, Chester, and the surrounding regions. To schedule an appointment, contact us by phone or e-mail today!